LADY LAKE, Florida (CNN) – The Villages, which bills itself as “Florida’s premier active adult retirement community,” is a regular stopover for presidential candidates hunting for votes in this quadrennial electoral battleground. Sarah Palin chose the sprawling golf haven as the place to make her Florida debut on Saturday, just her fifth campaign event apart from John McCain since becoming the vice presidential nominee. It may have been a wise choice, if only for the optics - on the same day Barack Obama drew over 20,000 voters to an outdoor rally in North Carolina, Palin attracted tens of thousands of her own sun-baked supporters. Though the audience was one of the Palin’s largest to date, the actual size of the crowd was unclear. 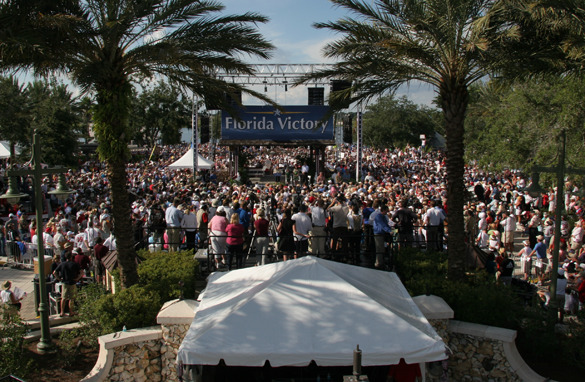 According Mike Tucker, the fire chief of The Villages who was made available to the press by the McCain campaign, 60,000 people crammed into the streets to see Palin speak. “There were people down the side streets, people down in the parking areas, people who couldn't quite make it around to the main areas,” Tucker said, adding that many people were let into the rally without tickets, making the crowd count impossible to verify. The enthusiastic crowd welcomed Palin with shouts of “USA!,” and she chanted back along with them. As in many of her speeches, Palin promised that hard-working Americans will dig the country out of its current economic woes, lacing her remarks with fulsome praise for the nation's industrious spirit. She used the words “America” or “Americans” 24 times during her 22-minute speech. Palin said McCain “took a clear stand” and “offered his own recovery plan” in response to the crisis that unfolded on Wall Street last week, but accused Obama with waffling in his response.